Roger Williams, Texas’ 105th Secretary of State and a former professional baseball player, will impart some final words of wisdom upon SHSU’s summer graduates during commencement ceremonies on Aug. 9. Approximately 897 degrees will be conferred at 10 a.m. on that day for the colleges of Arts and Sciences, Criminal Justice and Humanities and Social Sciences and at 2 p.m. for the colleges of Business Administration and Education in the Johnson Coliseum. An entrepreneur, political activist and statesman, Williams became Texas’ 105th Secretary of State in 2005. During his almost two and a half years in the position, he served as the state’s chief election officer, assisting county election officials and overseeing the state’s efforts to comply with the federal Help America Vote Act to ensure the uniform application and interpretation of election laws. In the role, Williams also worked to promote economic development, investment and job creation in Texas and served as Gov. Rick Perry's chief liaison to Mexico and the Border Region of Texas, in which capacity worked with Mexican federal, state and local officials on common issues. 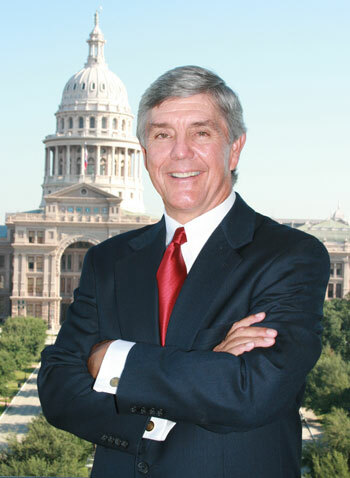 Currently serving as chairman of Texas Victory 2008, Williams has become a champion of Republicans through his coordination of the statewide get-out-the-vote effort for the Republican ticket. He chairs the Republican National Finance Committee’s Eagles Program, a position to which he was previously appointed by President George W. Bush in 2001, as well as serving as the Texas State Chair of the Republican National Finance Committee. He previously served as the North Texas Chairman for the Bush/Cheney 2000 campaign, as National Grassroots Fundraising Chairman for Bush/Cheney ’04, Inc, and State Finance Chair for John Cornyn for U.S. Senate, Inc., in 2002. The former Atlanta Brave graduated from Texas Christian University, to which he later returned to serve as head baseball coach, and is a current member of the TCU Athletic Hall of Fame. He has been a small business owner in Fort Worth and Weatherford for 35 years.